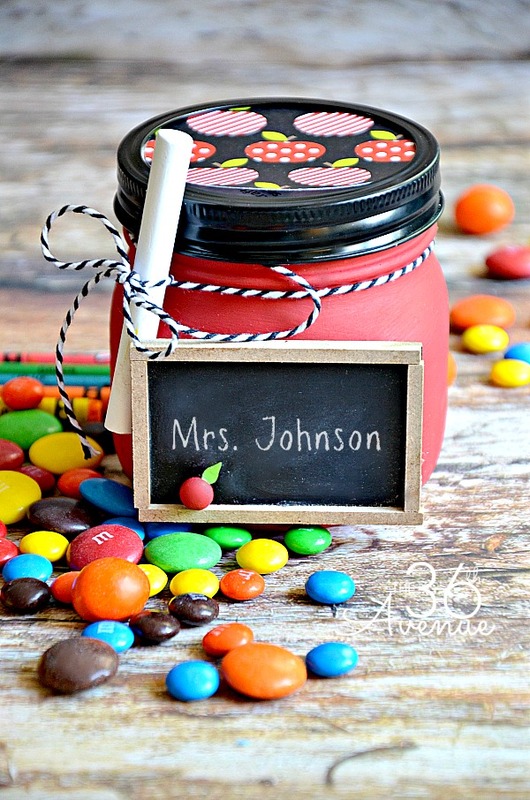 I love making handmade gifts and we love teachers, so I came up with these DIY School Mason Jars that are perfect for Teacher Appreciation Gifts. 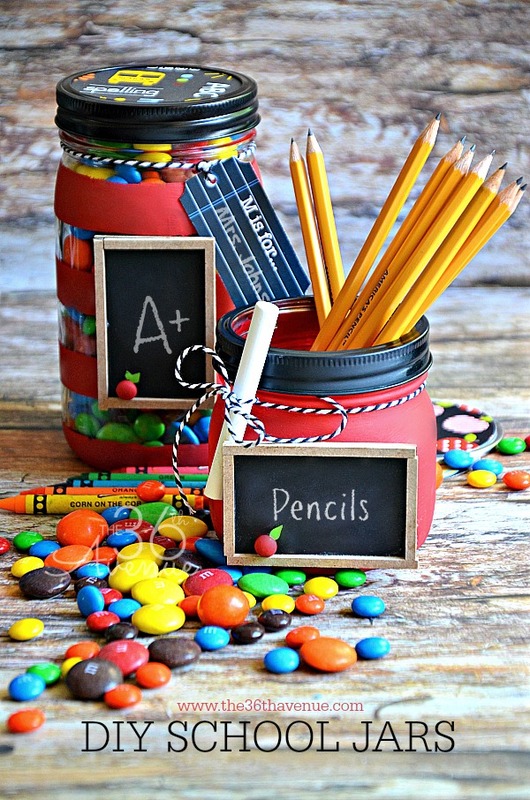 With Back to School around the corner I thought this would be a sweet way to welcome and wish an amazing new School Year to my kiddos’ teachers… Take a look! 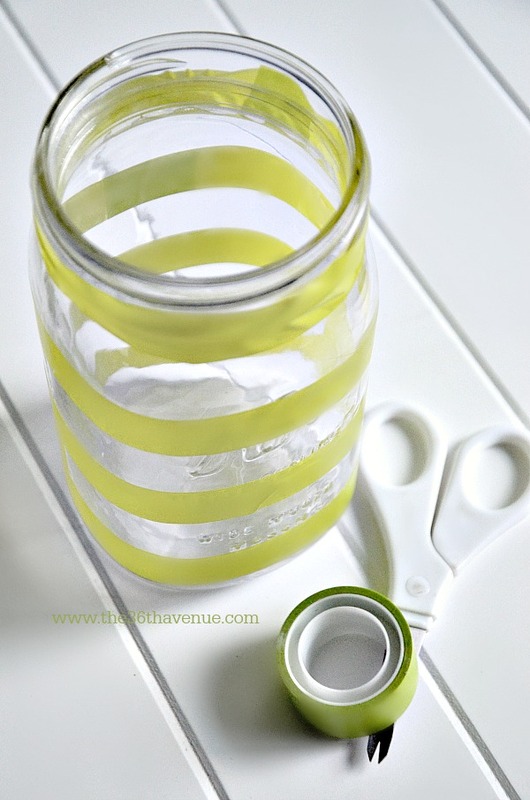 The best part is that these jars were very easy to make… Let me show you how! Clear Mason Jars – Choose any size you like! 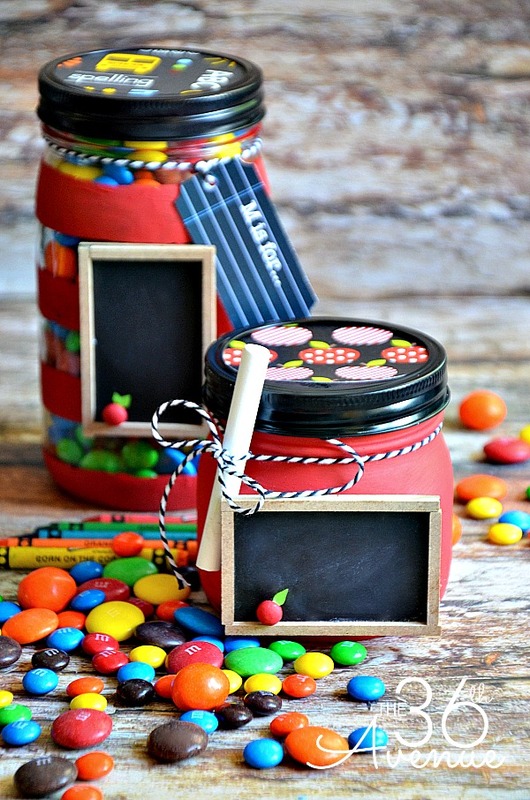 Mini Chalkboards – You can also find them at your local Craft Stores. 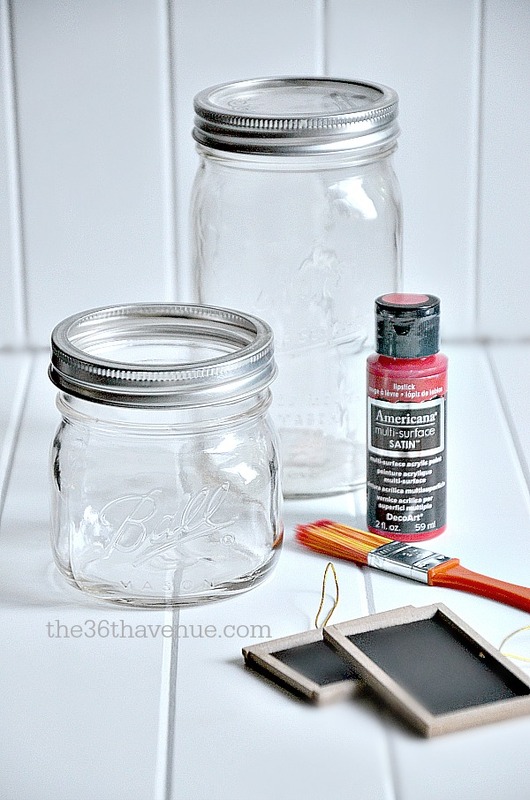 The first thing you want to do is clean the jars throughly before you paint them. 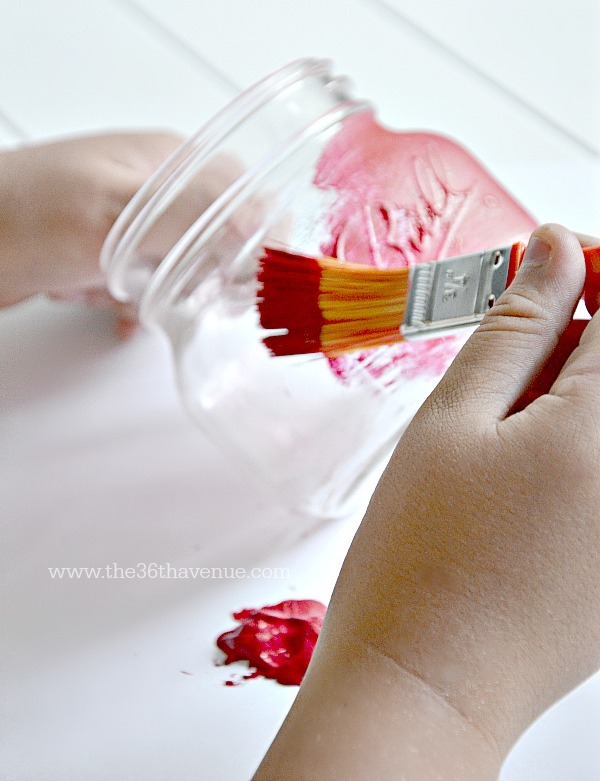 When they are clean and dry use acrylic or spray paint to paint the outside of the jar. You are going to need two to three coats of paint. Make sure to let the paint dry completly between coats for best results. My son helped me with this part of the job… Kids love to paint! 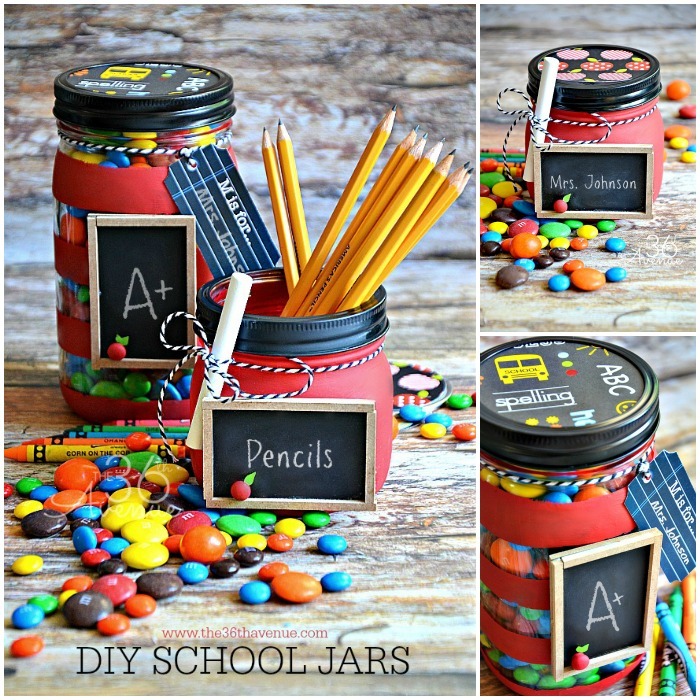 For the largest jar I used tape to make the stripes so we could see the candy through the jar. To paint the lid-ring I used black spray paint. Now that your jar is dry it’s time to glue the mini chalkboard to the jar. Use a hot glue gun to do this! I made the little apple using a tiny wood peg, red paint, and green tape for the leaves. 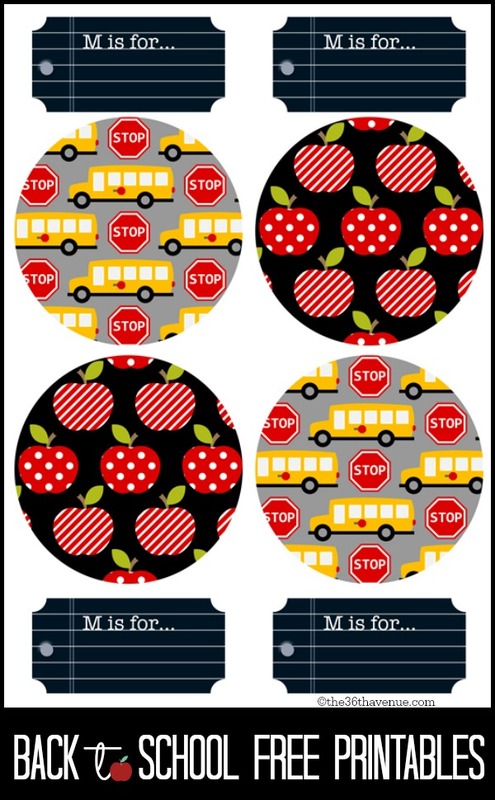 You can use scrapbooking paper or our free School Jar Printables to decorate the lid. For the tags use a white permanent marker to write the name of your children’s teacher. You can use the same marker to write on the chalkboard or you can use chalk instead! I love using Bakers Twine to tie anything around anything… So cute! 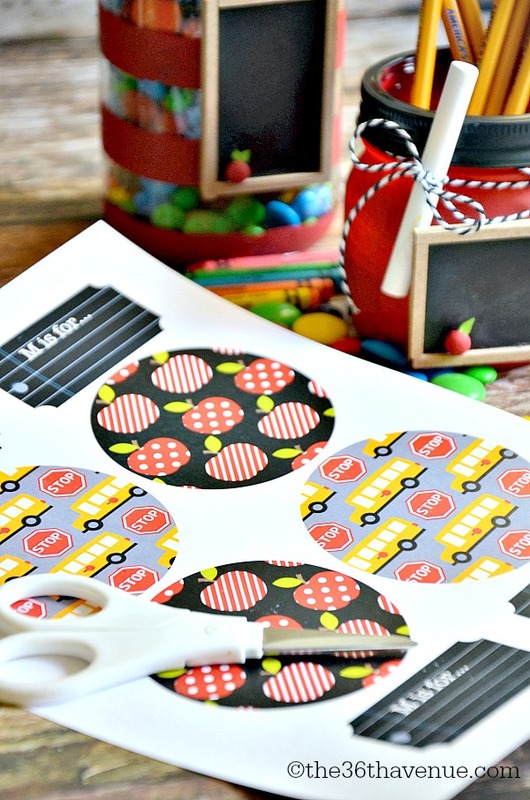 Feel free to click HERE to print our tags and lid printables. 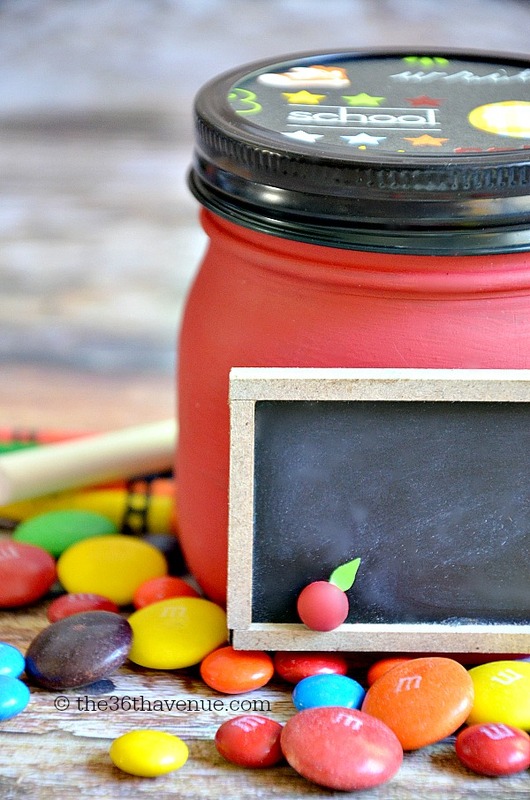 To embellish the smaller jar I tied a piece of chalk around the jar… Oh the little details! Now that the jars are finished fill them up with goodies. 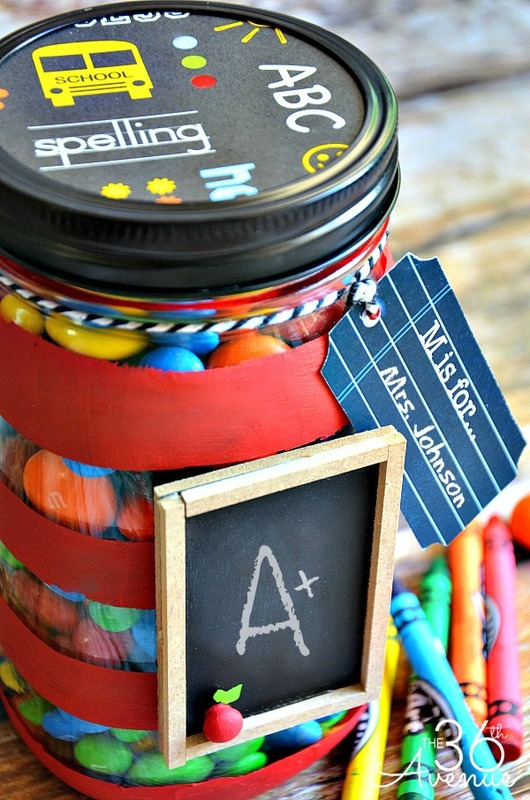 The M&Ms were perfect to match my “M is for Mrs…” tag! 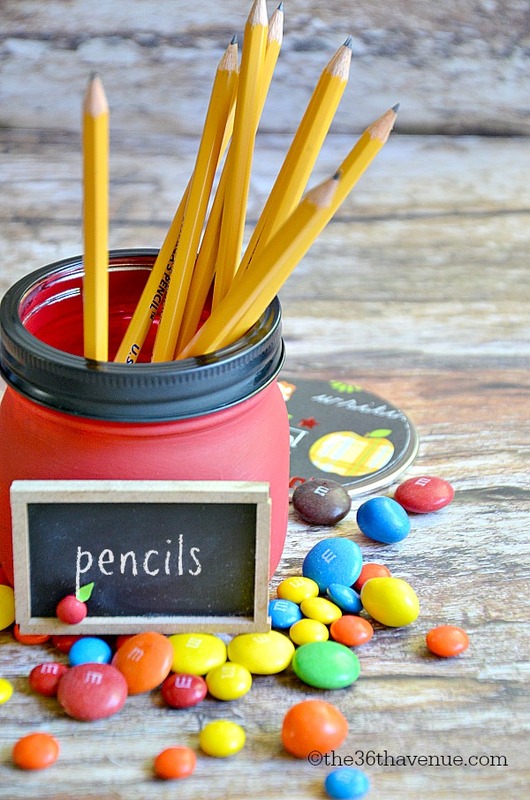 You can also fill them up with color pencils, crayons, erasers or anything that a teacher would appreciate. This is about showing gratitude for the amazing work they do! 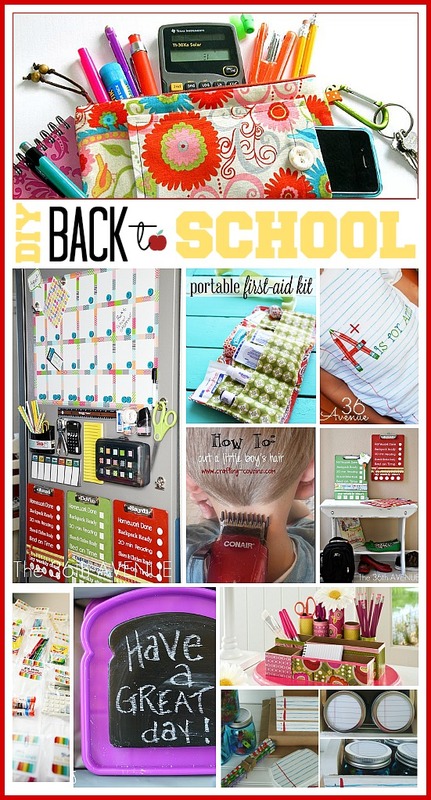 Before you go make sure to also check out these other Back to School projects! 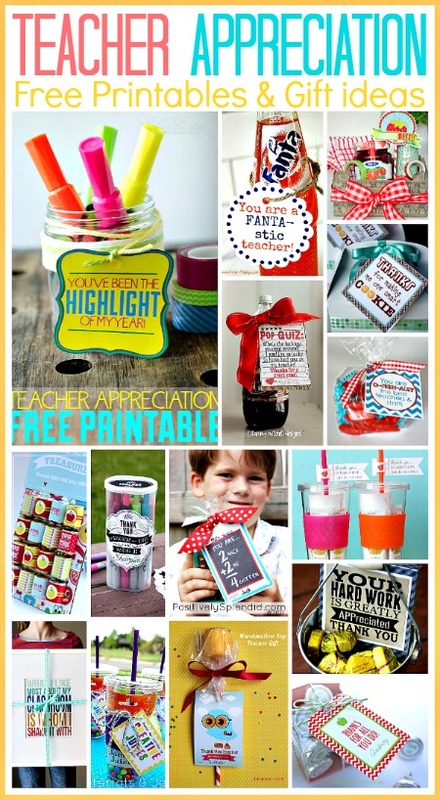 Such a cute gift idea for teachers and teens! As always thank you so much for taking the time to stop by! We love hanging out with you! Stopping by from The Party Bunch link party. These are so cute! The tiny apple on the chalkboard is my favorite and adds just the right touch. These are so awesome. The mason jars caught my attention but I love emergency kit. Love your creativity. Will be making these for my daughter who is in high school and still loves to give her favorite art teachers gifts at the beginning and end of school year. Thanks for sharing! Super Cute! Pinned!